WASHINGTON — President Trump so far has struggled to turn his rhetoric into policy accomplishments, but linguists in America and abroad are noticing a new trend — Trump’s words are increasingly changing the English language itself. “People create words for the things they’re talking about and the things they’re thinking about, and right now people are talking and thinking about the Trump administration a lot,” said Katherine Martin, head of dictionaries at the Oxford University Press. “We expand language [when] we need to express things that we’ve never expressed before,” Martin said. To that point, experts said the degree to which Trump is altering the English language is unprecedented for a president only 200 days into his first term. The president, who spent years branding his businesses in America’s hotel and entertainment industries, has also brought that sense of showmanship to the White House. This has presented some new challenges for lexicographers and linguists. Martin’s team at Oxford University Press in New York is looking to see which words, if any, rise to the threshold of being added to the dictionary. At Dictionary.com, a less formal online site where many turn for a quick definition, lexicographers have already selected some new words and phrases to add to their portal. The list includes “fake news,” “post-fact,” and “kompramat,” a Russian term for compromising material. “There’s always interest in political words, but looking at the data from other years, nothing seems as pounding and as constant as this,” said Jane Solomon, a language expert at Dictionary.com. She pointed to one example in late 2015, when Trump said then-candidate Hillary Clinton got “schlonged” when she ran for president in 2008. The term was largely derided as vulgar and sexist, but for linguists such as Solomon, there was another problem: Trump was using the word as a verb, and not a noun — its more commonly accepted part of speech. “He’s using words in ways that are confusing and not straightforward, and some people are looking [it] up, thinking, ‘Did he say what I think he said?’ ’’ Solomon said. White House press secretary Sarah Huckabee Sanders and other senior staffers have long asserted that Trump’s unique style of communication was one of the reasons he won the presidency. Earlier this week, after some political observers gawked at Trump’s warning of “fire and fury” for North Korea, White House adviser Stephen Miller said Trump was the greatest presidential speaker — ever. “President Trump is the most gifted politician of our time and the best orator to hold that office in generations,” Miller said on Fox News Tuesday. Trump himself addressed his unique speaking style during one campaign stop in South Carolina in December 2015. Trump is undoubtedly stretching the boundaries of where public presidential language had gone. Linguists said the specialists who work on dictionaries have been bombarded by terms with vulgar or bigoted connotations because of Trump’s association with far-right Internet subcultures, his history of using derogatory language, and the recent expletive-filled rant by Anthony Scaramucci, his White House director of communications who was fired after 10 days on the job. According to Martin, the Oxford lexicographer, other presidents have had memorable phrases associated with them, such as “Mission Accomplished,” the banner that flew aboard a US aircraft carrier when George W. Bush declared US victory in Iraq in 2003, and “I didn’t inhale,” what Bill Clinton, as a candidate, said about his relationship with marijuana. 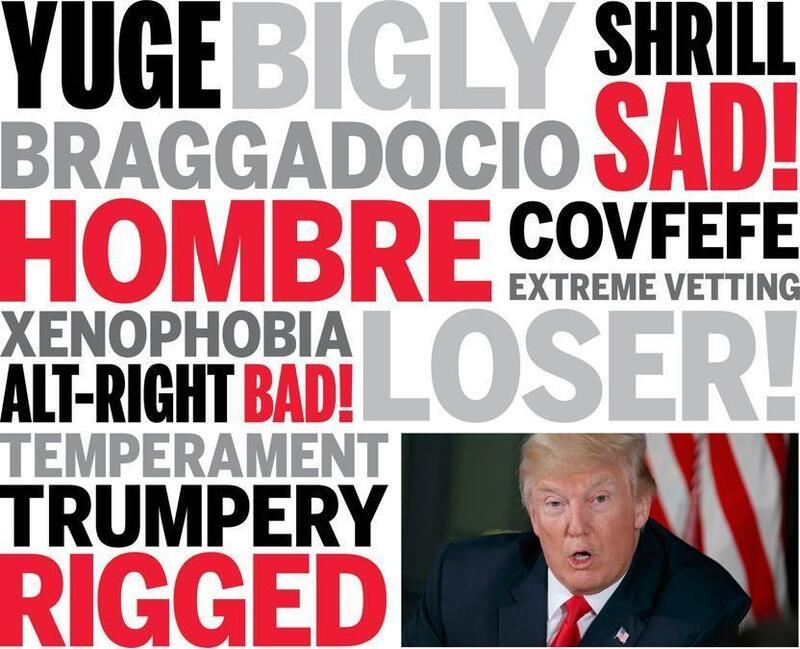 Words and punctuations such as “Sad!”, “Bad!”, “Bad deal!”, and “Loser!” appear on the Oxford dictionary list compiled by Martin, not because they are new words but because Trump has used his Twitter account to change the meaning of those bite-sized phrases, particularly through his use of exclamation points. Martin’s list also includes a flood of compound Trump words used by journalists, pundits, and members of the public, including “Trumpkin,” “Trumphoria,” and “Trumpy,” an adjective. She said the rise of these words can be attributed to Trump’s catchy name, which is easier to combine into new words than his recent predecessors’. Jack Grieve, who tracks Twitter language trends at the University of Birmingham in England, said he has observed the rise of others mimicking Trump’s tweet style. Each of the linguists had a favorite example of the way they saw Trump influencing language. Grieve pointed to the term “doubling down,” which he said has grown, thanks to Trump, to become the opposite of a “flip-flop” in politics. Martin mentioned two: how the lowercase word “trump” is now rarely used because of its presidential connotation, and “bigly,” a dormant adverb first used in the 15th century, which Trump has almost single-handedly revived. Her favorite, however, is a newly discussed term called a “Scaramucci.” The meaning: a time measurement typically referring to a 10-day span. 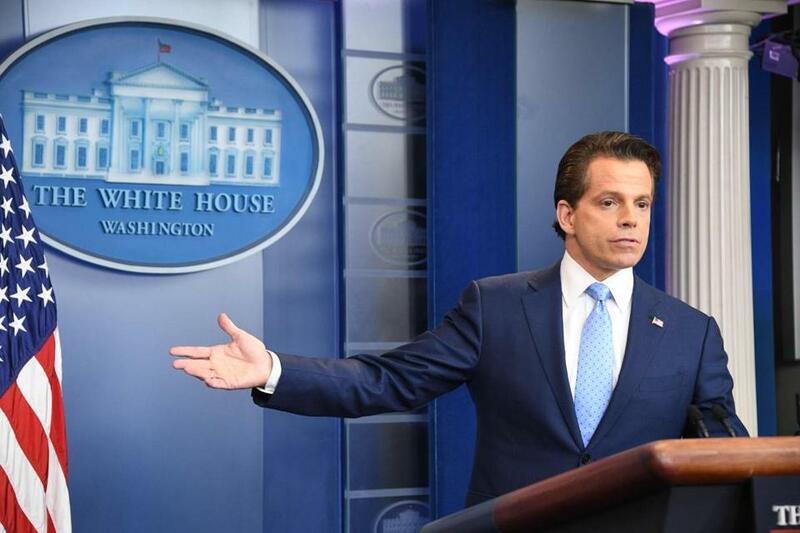 A “Scaramucci,” the name of the short-lived communications director, has become a new term meaning a time measurement typically referring to a 10-day span.